Do not exceed the motorcycle manufacturer’s Gross Vehicle weight limit when loading and pulling ANY trailer with ANY motorcycle. 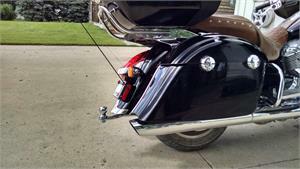 ALL HitchDoc motorcycle trailer hitches have a MAXIMUM tongue weight load of 40 pounds. Tongue weight must NEVER EXCEED 10% of the GROSS TRAILER weight including ALL CONTENTS AND CARGO. Motorcycle performance is always effected by adding a trailer to a motorcycle. Always ride in a conservative and safety conscience manner when towing a trailer with a motorcycle. Allow extra distance for acceleration and braking when pulling a trailer. Always decrease from normal cornering speeds when pulling a trailer with a motorcycle. When riding in groups with a motorcycle trailer, always ride at the rear of the group to minimize group accident exposure. Never exceed motorcycle manufacture, trailer manufacturer, or hitch manufacturer’s limits for gross weight or tongue weight. Never exceed posted speed limits for vehicles when pulling trailers which can be different than non-towing vehicles. Many states exclude, by law, vehicles towing trailers from the left hand, or so called fast lanes. Always use approved safety chains, and have them securely attached. Cross the safety chains under the tongue of the trailer so that the tongue will not drop to the road if it becomes separated from the hitch. Always leave just enough slack so that you can turn with your rig. And, never allow safety chains to drag on the ground. Trailer tire pressure should be inflated to maximum allowable pressure, unless otherwise recommended by the trailer manufacturer. Rear motorcycle tire pressure should be inflated to maximum allowable pressure (refer to tire side wall marking) and checked periodically. Towing a trailer required a certain amount of experience. After loading the trailer, weigh the trailer and then the tongue separately, to see if the weights are proper. If trailer sways or bounces while towing, SLOW DOWN BY REDUCING SPEED GRADUALLY and STOP TOWING immediately. Unless cause can be determined, i.e. shifted load, low tire pressure, etc., which can be corrected, do not resume towing. 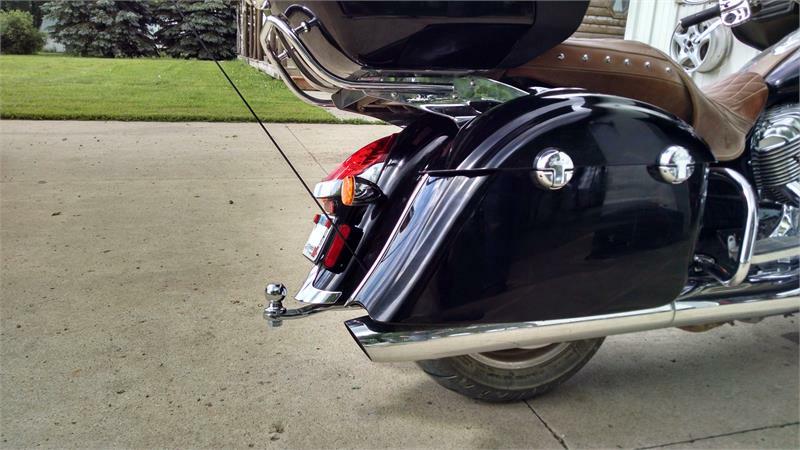 *Our hitches are designed to fit on stock bikes. *Our hitches are not recommended with a one wheeled trailer.